Heavy duty bracket for 28mm (1 1/8") diameter poles. Part of the Rolls Neo collection of curtain poles and accessories, the heavy duty end bracket is sold individually and designed for use with the Rolls Neo 28mm (1 1/8") diameter poles. Available in all coordinating colours from the range including stainless steel, spun brass, chrome and black nickel, each bracket is made from steel and includes all wall plugs and standard colour coordinating fixing screws. 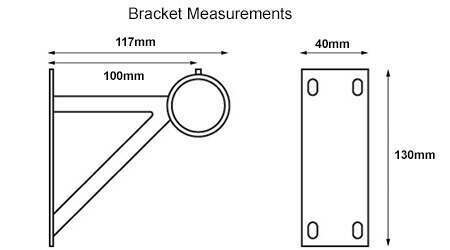 If purchasing the brackets to make up a standard straight curtain pole then a centre bracket is required when joining two poles, or for pole lengths of 240cm (94 1/2") and above, see the ‘Related Items’ below. If this correct quantity of brackets are fitted to the Rolls Neo 28mm (1 1/8") metal pole, then they will support heavy weight curtains of up to 15kg. Wall fixing bracket for Rolls Neo 28mm (1 1/8") diameter poles. Coordinating poles, curtain rings, finials and holdbacks are all available – see the ‘Related Items’ below.